With a lot of strong, German background in my heritage, I have to admit that I love a good Oktoberfest celebration. The biergartens, the meat-based dishes, the music, the potatoes… a sweet remainder that we have turned another season and Fall is in full-swing. On a good Fall day, I’m not denying that it may be our gut reaction to reach for a great brew: Oktoberfest, Hefeweizens, and – nowadays – Pumpkin Ales fill the beer lists. These foods definitely point me in the direction of many, unoaked, refreshing white wine varieties. Why white wines? White varieties tend to have a higher acidity than many red wines and since many of them see little to no time in oak aging, they are very fruity and refreshing. The acidity helps to cut the fattiness associated with several of the foods listed above. With the foods that have a strong salt-ingredient, the salt actually helps cut down the perception of sourness – or acidity – in the wines. The aromatic nature of these white wines is just, well, alluring. Though, if you’re a tried and true red wine drinker, I also have a few selections that you may find interesting during the month of October. For wine selections, I returned to a wine producing regions that have vineyard roots close to Oktoberfest celebrations: Germany and Austria. Let’s take a look at a few varieties that have a strong heritage in these countries and how they could be great varieties to explore for an Oktoberfest meal. 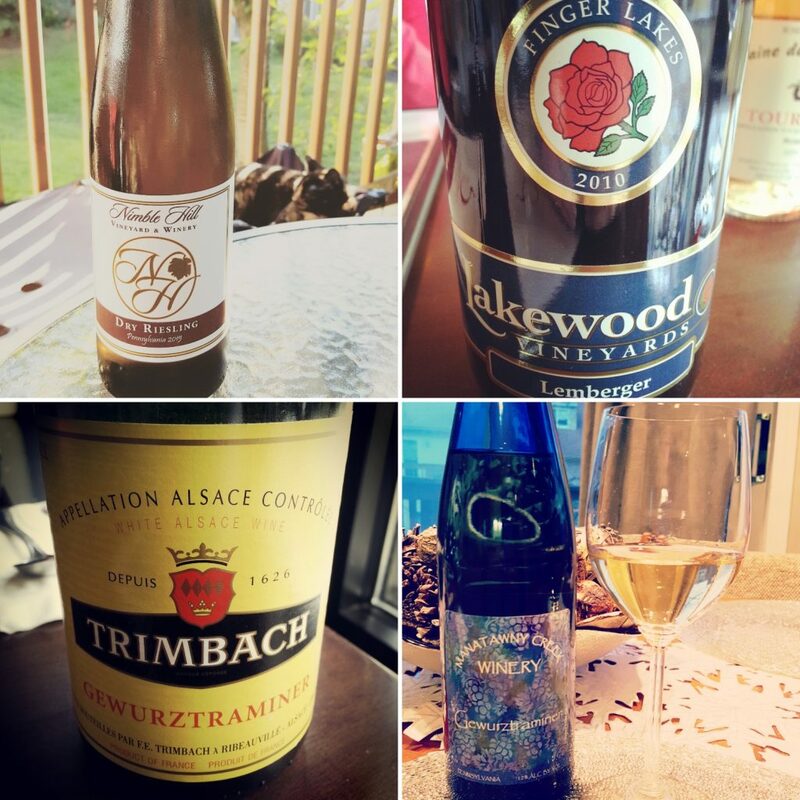 Dry Riesling by Nimble Hill Winery (Pennsylvania), Lemberger by Lakewood Vineyards (Finger Lakes, New York), Trimbach Gewurztraminer from Alsace (France), and Manatawny Creek Winery Gewurztraminer (Pennsylvania). Remember, U.S.-produced wines may be able to be shipped to you if you cannot find in your nearest grocery store, state-owned liquor store, or wine distributor. Riesling: Germany is well known for its Riesling production, and while Riesling can be a very “serious” wine varietal amongst enthusiasts to study, it can also be flat out fun to consume. Riesling is considered an aromatic white variety meaning that it has a very powerful and intense aroma or smell. Recognizable aromas of Riesling include hints of citrus fruits, peaches, apples, pears, wildflowers, grapes and tropical fruits like pineapples, melons, and mangoes. Nonetheless, the extent of how intense these fruity and floral aromas will be really depend on where the grapes are grown and how ripe they were upon harvest. Germanic Rieslings can be intimidating for most consumers to select in a wine store. In general, the American public does not readily understand the German way of classifying Riesling wines, and designations like “Kabinett” or “Trockenbeerenauslese” refer to the level of ripeness or sweetness that grapes were picked at; not the wine’s sweetness. If you purchase an American Riesling, you’ll likely find it labeled “Dry Riesling,” like the wine pictured here in this blog post, if it’s difficult to perceive the sweetness of the wine. Nowadays, too, many Riesling producers participate in the International Riesling Foundation’s sweetness scale, which can be found on the back label of the bottle to indicate how sweet the Riesling wine is in the bottle. 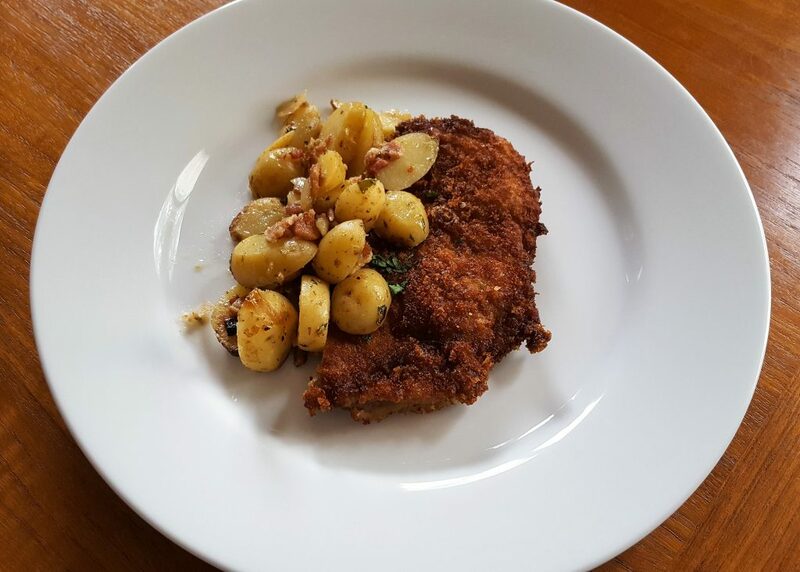 Whichever your preference, dry or sweet, Riesling’s sharp acidity and aromatic intensity will delight your taste buds in a stark contrast to your salty pretzel or fried and [slightly-fatty] wiener schnitzel. Gewürztraminer (aka Gewürz): If you are a fan of Riesling, or like its aromatic nature, the next “wine up” is Gewürztraminer. The aromatic intensity of this white wine variety explodes compared to Riesling, and it has a much stronger floral flavor compared to its Riesling cousin. Gewürz also tends to be a bigger, fuller wine than Riesling: full-bodied or heavy weight in the front palate and it can abruptly end in the finish. Gewürz often has a touch of sweetness (or can be made very sweet) to balance the bitterness associated with its high tannin structure. While this can be a love-it-or-hate-it variety, I find that people that enjoy bitter, aromatic IPA beers often gravitate to Gewürz. Both this variety and IPA’s have very strong and dynamic aromatic components, and many of them have that bitterness that IPA drinkers tend to enjoy. My go-to Oktoberfest pairing here: bratwurst (or another Germanic sausage) and Gewürz! Grüner Veltliner (aka Gruvee): A staple in the country of Austria, Grüner Veltliner (which can also be abbreviated as Grüner, Gruvee, and GV) is a refreshing and citrus-focused aromatic white wine variety. While the aromatic component of this grape variety can be intense like Riesling, the make-up of the aromas is different. Aromas concentrate around more citrus fruits and citrus zest, coupled with what wine enthusiasts may consider “green” aromas like fresh cut grass, freshly picked green beans, freshly picked white flowers, and sometimes a spicy component like white or black pepper. If this sounds gross, I promise these are nuanced flavors and it complements the citrus well. Again, worth a try. Unlike Riesling, GV is almost always on the drier end of white wines and has a noticeable acidity (i.e., sourness). Again, this makes it a great wine selection for fatty or fried foods. 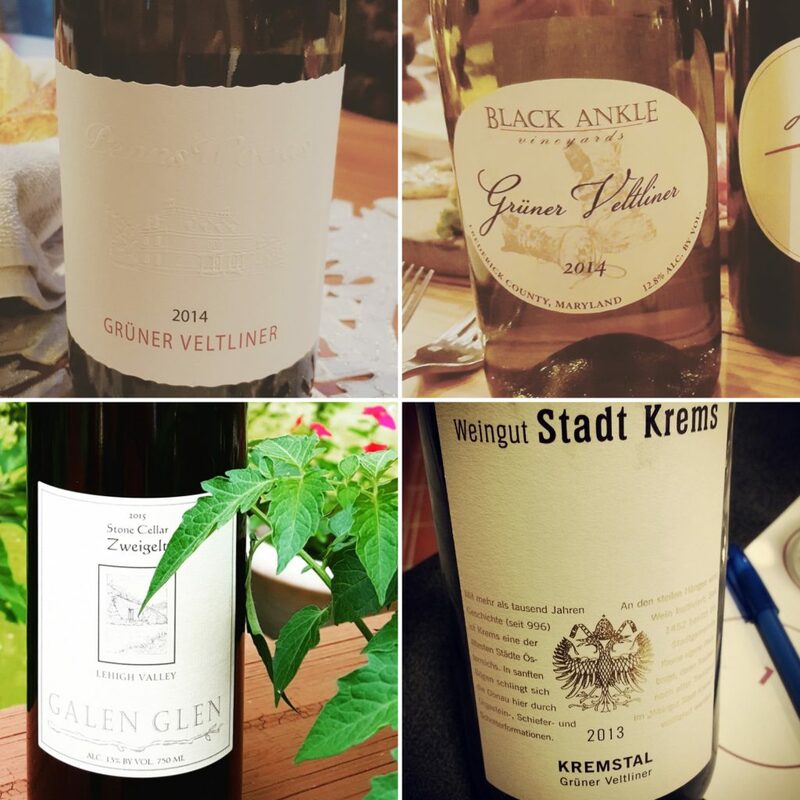 Austria has several designations of Grüner, and their flavor is going to vary widely. However, if you live in the Eastern U.S., you’ll find that Grüner is emerging from many local producers. This is because Grüner grows especially well in this climate and can be used to make a very nice wine. Where would I suggest Grüner for Oktoberfest? Definitely with the schnitzel. It’s worth it! Zweigelt: I promised some red wine selections, and I’d love to start with the Austrian variety, Zweigelt. This is a spicy red wine variety, often coupled with some substantial red fruit (i.e., fresh red raspberries, red currants, and cherry) aromas. If it sees some production time in oak, it can also have some smoky oak and toasted vanilla flavors. The reason why this is a great Oktoberfest wine is because it still has retained acidity and great complementing flavors that are bound to work with the flavors in your Oktoberfest food. Bonus for Northeasterners, I know of one producer in Pennsylvania, Galen Glen Winery that makes a smashing Zweigelt that delivers on fruitiness and oakiness! Lemberger (aka Limberger aka Blaufränkish): I know the name of this Germanic-and-Austrian red wine variety can turn people off, but it’s worth a try if you like full-bodied, complex reds. This dry wine tends to be a bit difficult to describe. It does have a natural acidity, like Zweigelt and the other white wine suggestions for Oktoberfest, though it has an earthier and herbal nature compared to Zweigelt. It has a subdued red fruit aroma and flavor, and is often coupled with aromas of fresh tree bark, toasted bread, dried savory herbs, and a light essence of black pepper. Although, I have found some unoaked versions that remind me of fresh red cherries with that fresh, woody nuance as well. If this is a new variety for you, then I almost always recommend trying it with food because it really feels like a food-and-wine type of wine to me (as opposed to a sip-by-the-pool or on-the-patio kind of wine). Oktoberfest is a great place to try this wine. Because of its woody nature, I like it against the German potato salad, but also against many of the sausages associated with Oktoberfest. Sometimes the hint of fennel addition in the sausage really brings out the earthy and herbal flavors I find in many Lembergers. Again, this is another variety grown in the Northeastern U.S., especially in Pennsylvania and New York, and I think they are definitely worth a try! White Label Grüner Veltliner from Penns Woods Winery (Pennsylvania), Black Ankle Vineyards Grüner Veltliner (Maryland), Stone Cellar Zweigelt from Galen Glen Winery (Pennsylvania… try their Grüner, too! ), and Stadt Krems Grüner Veltliner (Kremstal, Austria). Remember, U.S.-produced wines may be able to be shipped to you if you cannot find in your nearest grocery store, state-owned liquor store, or wine distributor. Sparkling, especially Brut sparkling. If you have found a new producer and want to give them a try, now is the time to do it! The crispness and carbonation of a sparkling wine is going to “lift” the food’s flavor and make you enjoy Oktoberfest even more than you would have otherwise. Viognier. Undoubtedly if you are going to pair a Viognier wine with an Oktoberfest entrée, I suggest finding a Viognier from Virginia. In my humble opinion, some of the most lively Viogniers are produced in Virginia and they deserve great food pairings. Dry Rosé: Much like unoaked white wines, dry rosés contain the natural acidity that will cut through the fattiness associated with Oktoberfest dishes. Rosés offer a more neutral and less intense aroma profile than many of the whites recommended above. Moscato: If you are a sweet wine drinker and the Riesling selection hasn’t cut it for you, Moscato offers another fun option. Opt for Moscatos grown in cooler regions like the Eastern U.S. or Asti in Italy to get the right acidity for this pairing. Pinot Grigio/Pinot Gris and Unoaked Chardonnay: These are easy go-to’s, but may be a little less fun than the varieties I introduced, above. Nonetheless, if these are your only options – go for it! If you’re interested in trying some new wine brands or varieties, I post my wine tasting log on Instagram. Please feel free to follow me today for more meal and wine suggestions!